Hadley Beeman wonders how best to characterise the new approach she is devising to aggregate public data to allow questions to be asked of it and services to be built on it which do not need to understand the underlying data. How is that useful to users? It’s simple. Just throw away everything which isn’t the answer to their question. What’s left is the distillation of value. 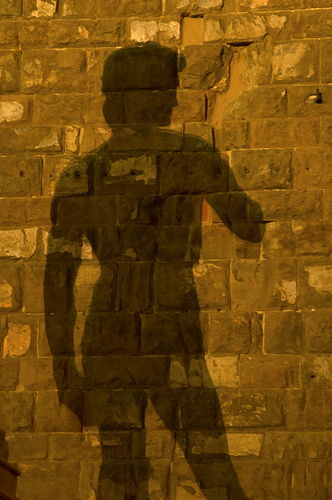 Shadow of Michelangelo’s David on wall, Piazza Della Signoria, Florence, Italy by Robert Crum licensed under creative commons, some rights reserved. This is great, Stefan! As you’ve pointed out, it feels like we’re venturing into new territories of public service delivery, economic opportunities, and an appreciation of data as its own asset. I’m finding, as we progress, that metaphors are becoming increasingly valuable for communicating the potential here. This is a great one; tactical, familiar and incredibly relevant. It is also an angle I hadn’t considered in depth until you mentioned it. I’ll be using it again for sure. Thank you for writing it down, and thanks again for your time and help! Yes, that’s spot on. The apps should be defined by the questions not the data. But what we know is the data not the questions, which is why bringing them together is hard.